DJ Rockid returns to the Rub A Duck imprint with his brand new “Trinity EP”, which was preceded by last year’s “Bonecrusher EP”. DJ Rockid started DJing at the age of 16 and quickly set his reputation as turntable virtuoso. He has been making his mark in the clubs for the past fourteen years, in which he practically played every club in The Netherlands and performed in front of thousands at national events like Mysteryland, FFWD Dance Parade, Amsterdam Dance Event, Latin Village and Dance Valley. He’s no stranger to international festivals either, where he’s graced the stage at both the Detroit Electronic Music Festival and world-renowned Glastonbury Festival. Known in the clubs as the quick-fingered mixing maestro, his name is now interminably linked with his very own, aptly dubbed, eclectic! sound – best described as an exhilarating mix of house, hip hop, electro, breakbeat, garage and bass. DJ Rockid set a solid foundation for his success many years ago: born in South Korea, Rockid learned to love music from an early age. After moving to The Netherlands, his interest in music developed further and the turntable soon became his instrument of choice. Starting out playing hip-hop tunes, he learned the art of scratching and decided to hone his skills by entering the DMC DJ championships in 1998. It was there where things first exploded: DJ Rockid didn’t only rock the house, he also went on to become the Dutch DMC champion five years in row and represented The Netherlands all the way to the finals in New York, London & Paris! With both “Trinity” and “Dragon Balls 5000” DJ Rockid paves the way for some seriously grinding electro house. Rockid’s beefy beats serve as the silver platter on which he presents his abstract, growling synth stabs and chopped drum fills; also note the use of the Amen break in “Dragon Balls 5000”. The C.O.N.E. remix tackles “Trinity” with a dueling blend of electro and dubstep, while O.Crow’s straight up dubstep beats and drops anchor big strings in the break. 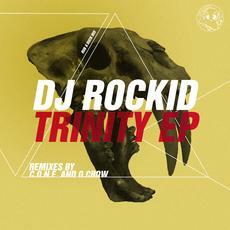 DJ Rockid’s “Trinity EP” is rough, rugged and raw; a sweet low-end punch for beat junkies. We love hearing new music here at ukgarage.org; let us know about your new mix or promo and we'll check it out!